On March 16th, 2010, CatholicTV will broadcast a wonderful documentary, Solanus Casey: The Healing Prophet , on the life and work of Solanus Casey in our Catholic Saints & Lay People programming block at 11:30am. Fr. 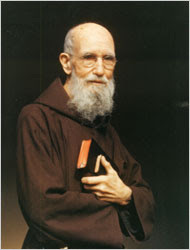 Solanus Casey was a Capuchin Franciscan ordained in 1904. He served for 20 years in Harlem, and Yonkers in New York. In 1924 he was assigned to St. Bonaventure Monastery in Detroit where he worked for another 20 years. He served as a porter in the monsastery where he lived, a humble life of welcoming those at the door. This service of hospitality at the monastery door as porter he met thousands of people from every age and walk of life and earned recognition as "The Doorkeeper." He was always ready to listen to anyone at any time, day or night. The purpose of the Fr. Solanus Guild is to keep alive the inspiring memory of Fr. Solanus; knowledge of his exemplary life to others; archive information about his life and work;provide prayer, support, and office services to the Vice Postulator for the Cause of Solanus Casey.